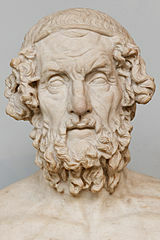 A photograph shows a marble bust of Homer. He appears to be wearing a headband, below which his hair and beard have been expertly carved, falling down his head and neck in curls. This marble bust depicts Homer, most notably the credited author of the Iliad and the Odyssey. The Iliad is one of the earliest works describing ancient Greek medicinal knowledge and practice; for example, detailing the lethality and treatment of various battle wounds. The text also illustrates the ancient Greek belief of a connection between spiritual affairs and physical health, as exemplified when the angered god Apollo uses his plague-spreading arrows to strike the Achaean army with a disease. At the time of photograph, this bust was housed in the British Museum in London.